With the Thanksgiving holiday just around the corner, Warner Bros. Pictures has released the second trailer for 12 Strong, based on the declassified true story of the Horse Soldiers, the first group of soldiers sent into Afghanistan after the 9/11 terrorist attacks. While there is not necessarily a direct correlation between these soldiers at the Thanksgiving holiday, the trailer opens with a brief segment that features bits of footage with the messages, "Thankful for home," "Thankful for freedom" and "Thankful for family" before the trailer begins. On our darkest day, they were our greatest hope. 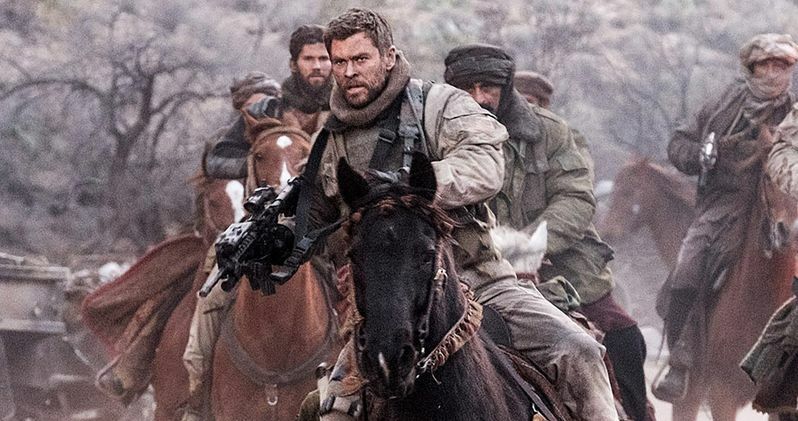 12 Strong is set in the harrowing days following 9/11 when a U.S. Special Forces team, led by their new Captain, Mitch Nelson (Hemsworth), is chosen to be the first U.S. troops sent into Afghanistan for an extremely dangerous mission. Their mission takes them to the harsh mountainous landscape of Afghanistan, as they try to convince Northern Alliance General Dostum (Navid Negahban) to become allies, as they join forces to fight their common enemy, the Taliban and their Al Qaeda allies. In addition to overcoming mutual distrust and a vast cultural divide, the Americans, accustomed to state-of-the-art warfare, must adopt the rudimentary tactics of the Afghan horse soldiers. But despite their uneasy bond, the new allies face overwhelming odds, as they're outnumbered and outgunned by a ruthless enemy that does not take prisoners. This powerful new war drama from Alcon Entertainment, Black Label Media and Jerry Bruckheimer Films tells the declassified true story of the Horse Soldiers. Based on the best-selling book Horse Soldiers, it is story of heroism based on true events that unfolded a world away in the aftermath of 9/11. Playing the 12 Strong U.S. Special Forces team are Chris Hemsworth, Michael Shannon, Michael Pena, Trevante Rhodes, Geoff Stults, Thad Luckinbill, Austin Stowell, Ben O'Toole, Austin Hebert, Kenneth Miller, Kenny Sheard and Jack Kesy. The ensemble cast also includes Navid Negahban, Laith Nakli, Fahim Fazli, Numan Acar, William Fichtner, Rob Riggle and Elsa Pataky, Chris Hemsworth's real-life wife who plays the wife of his character. Related: Will 12 Strong Dethrone Jumanji at the Box Office This Weekend? Award-winning director Nicolai Fuglsig directed the film, marking his major studio debut after his critically-acclaimed directorial debut, Exfil. Producer Jerry Bruckheimer leads the producing team through his Bruckheimer Films banner, alongside Molly Smith, Trent Luckinbill and Thad Luckinbill (La La Land, Sicario) under their Black Label Media banner. Oscar winner Ted Tally (The Silence of the Lambs) and Peter Craig (The Hunger Games: Mockingjay, Parts 1 & 2) wrote the screenplay, based on the acclaimed book by best-selling author Doug Stanton. The executive producers are Oscar nominees and Alcon principals Andrew A. Kosove and Broderick Johnson (The Blind Side), together with Chad Oman, Mike Stenson, Ellen H. Schwartz, Garrett Grant, Yale Badik, Val Hill and Doug Stanton. 12 Strong will be distributed domestically by Warner Bros. Pictures, a Warner Bros. Entertainment Company, with Lionsgate is handling international distribution. 12 Strong has been rated R by the MPAA for war violence and language throughout, with the studio handing out a January 19, 2018 release date for this modern-day war movie, putting it up against STX Entertainment's Den of Thieves, starring Gerard Butler and 50 Cent, and Roadside Attractions' Forever My Girl, starring Alex Roe and Jessica Rothe. Take a look at the new trailer for 12 Strong below, courtesy of Warner Bros. Pictures YouTube.